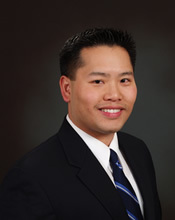 Dr. Chong has helped to provide care to professional athletes, including those from the NFL, MLB, and US Gymnastics. He has served as an orthopaedic consultant to the ATP (Association of Tennis Professionals), and he was an assistant team physician for Stanford University and Santa Clara University. Dr. Chong is board-certified by the American Board of Orthopaedic Surgery in both Orthopaedic Sports Medicine and Orthopaedic Surgery. He was appointed the Sports Medicine and Arthroscopy Expert for LiveSTRONG.com, and he is a regular contributing writer. He was given a Patients' Choice Award in 2012 and Compassionate Doctor Recognition in 2013. Dr. Chong has been selected by his peers for inclusion on the Super Doctors ® list since 2015. He was also named a Castle Connolly Top Doctor in 2017. Dr. Chong enjoys volunteering his time and skills, both locally and abroad. He has had numerous students and residents do rotations with him. He also has served as a Clinical Instructor in Orthopaedic Surgery at the University of Southern California, where he was awarded the Francis J. Schiller, M.D. Voluntary Faculty Award. He visited rural China on a medical missions trip, where he performed corrective surgeries and also instructed local doctors. Among Dr. Chong’s areas of expertise are shoulder stabilizations, rotator cuff repairs, knee and elbow ligament reconstructions, meniscus repairs, and cartilage transplants. He also specializes in arthritis and joint replacements of the knee, hip, shoulder, and elbow.